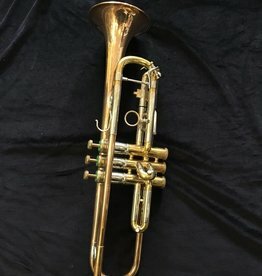 Selmer Paris Large bore 'radial valve' trumpet model 99. In lacquered finish. Mechanically excellent and it's lacquer is in fairly good condition too. 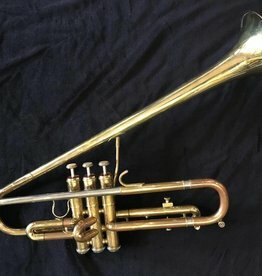 Great jazz horn with thick and rich sound. Comes with a basic case. Selmer Consignment Selmer 99 radial valve trumpet VINTAGE with large bore. Lovely older Bach Strad 37 in silver, a real player! Olds Recording trumpet in great condtition. Made in the 50's and highly sought-after. Plays well. Comes with a basic non-original case. Getzen 900H 'dizzy bell' ETERNA professional trumpet. A very nice and slightly warm and positive sounding trumpet with great-feeling valve block. Comes with good original larger case.